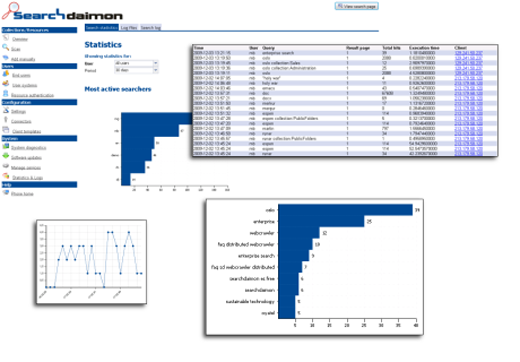 Searchdaimon is a open source search engine for corporate data and websites. It is as simple to use as your favorite Internet search engine, yet it has the added power of delivering results from numerous systems with standardised attribute navigation. Searchdaimon is easy to install, open and scalable. Run it for free as a VMware/Xen/VirtualBox Virtual appliance. Run it for free on your own server. Run it in the Amazon cloud. ...or buy it as an appliance from us. Index Microsoft® Exchange, SharePoint®, files and databases. 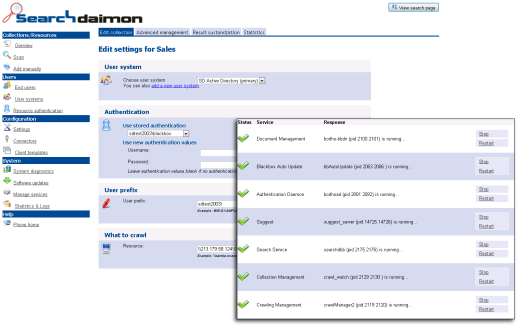 Optional connection to Microsoft® Active Directory to maintain existing permissions. Suited for the cloud and SaaS. Write your own data connectors. Get search results as XML or OpenSearch. The Searchdaimon Enterprise Search (ES) aims to be an Plug'n'Play open source solution for information retrieval for websites and companies. Our solution comes complete with operating system and software as an virtual appliance. It can be installed on a standard Intel server, on a VMware/Xen/VirtualBox platform, in the Amazon cloud, or you can get it as a Search Appliance on a server supplied from us. Searching is ofcourse the most important aspect of the ES. A clean and simple user interface gives you search results in seconds, and the advanced functions such as filtering and sorting are there when you need them. You can restrict your search to type of document, data source, date and meta-information such as contacts, customers, sales and projects. You can also sort on date or relevancy. Structured data can be presented as a table among the results. Often you'll see the information you need in the user interface, without having to open the data source itself. Here you see a hit from a SharePoint list of contacts. Notice how the email address is directly visible in the results. Query words are suggested as you type. The ES can propose correctly spelled words if you have misspelled a word. For example correcting "enterprie serch" to enterprise search. As for Suggest, the dictionary is built from indexed documents. 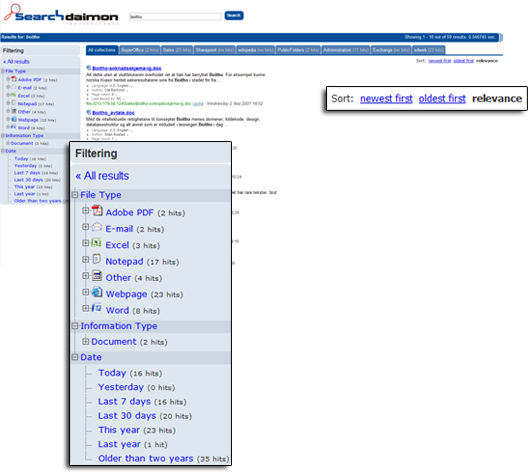 Searching for "car" also shows documents containing "cars", etc. Searchdaimon ES can easily be integrated with you existing systems. It will let you search information from documents, e-mail, attachements, customer relation systems and other content sources. Everything is done from a intuitive web user interface, and can be compared with using Google, only on your company's content. Support indexing of common enterprise systems like Windows file shares, Microsoft Exchange, intranet and external websites and Microsoft Sharepoint. You may also write your own connectors directly from our administration interface. Everything can be controlled from the web based administration panel. Easily follow user behavior and system performance. As mentioned above the ES can be installed on a standard Intel server, on a VMware/Xen/VirtualBox platform, in the Amazon cloud, or you can get it as a Search Appliance on a server supplied from us. The ES can be run at Amazon Web Services. AWS is the world`s largest cloud computing platform. With data center locations in the U.S., Europe, Brazil, Singapore, and Japan, AWS provides a highly reliable, scalable, low-cost cloud computing platform that powers hundreds of thousands of businesses in 190 countries around the world. The ES can run as a virtual machine on a VMware/Xen/VirtualBox system. Basic virtualization software is free, and exist in both desktop and server versions. 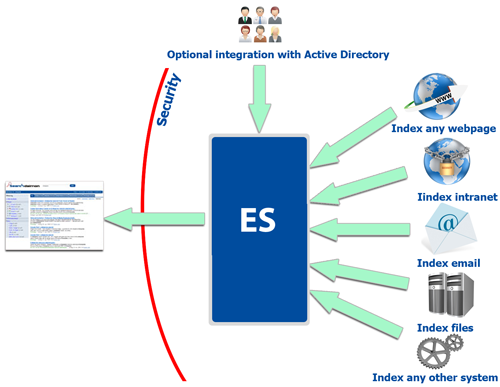 The ES can also be delivered as a physical Search Appliance. 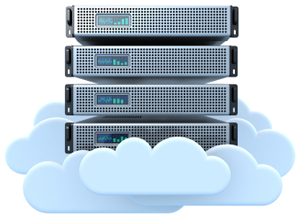 In Searchdaimon we have been working on cloud computing and virtualization for a long time. Already in 1998, for our Internet search engine boitho.com we developed one of the first truly fully distributed, shared nothing, file systems called “bfs”. We did setup our first MPI cluster in 1999. Searchdaimon has had an account on Amazon Web Services sins September 19, 2006. That's when it was still in limited beta, and you had to provide a small essay about what exciting things you would use it for. Searchdaimon is a VMware Technology Alliance Partner. We have extensively VMware experience, and run many of our own internal servers, customer demos and other development servers on our own internal ESX cluster. Personnel from Searchdaimon participate in two VirtualBox related projects; Portable-VirtualBox and VBoxVmService.